Rising damp occurs when there is a lack of an effective damp proof course within the property. 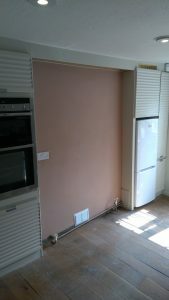 In order to carry out an effective treatment the wall plaster must be removed in the areas to be treated. Then a chemical damp proof course is installed by drilling into the masonry, injecting a specially formulated solution of Kenwood siliconate injection fluid or Kenwood DPC cream (depending on the construction of the property). 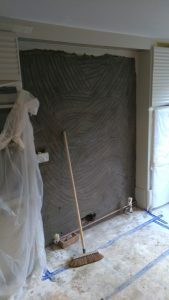 Removal of the wall plaster is crucial to the treatment working as when moisture rises up through the masonry it brings with it salts from the ground. Salt will always attract moisture and therefore the salt laden plaster must be removed. During the replastering Kenwood use a specially produced plaster which contains salt inhibitors as well as additives to reduce the incidence of shrinkage cracks. The works are completed with a beautifully smooth final plaster coat ready for redecoration once dry.